Hey, friends! Well, some of you may already know, but I am currently hanging out at Hotel Baylor Hospital, attempting to keep the boys tucked snug inside for a few more weeks. I went in for my weekly check up on Wednesday, and my cervix was much thinner/shorter than the doctor would prefer, so she immediately sent me over to Labor and Delivery. I was indeed having contractions, pretty close together, so they decided it was best for me to stay put. Fast forward to Saturday afternoon, and I am still here. I should have been enjoying my baby shower that was scheduled for today, but unfortunately, the boys and my doctor had other plans. After seeing my condition on Wednesday night and Thursday (insert the beast of a medicine called magnesium - more to come on that later), we decided to cancel the baby shower. We may, if I ever get out of here, have something small at my parents house... but we're not sure. The nurse even told me that I could have it up here if I wanted. Apparently they have a conference room where these types of things take place quite frequently. Again, not sure what's happening for the long run at this exact moment, so we're all just taking it day by day. But anyway, as I am sure you can imagine - I am bored. BORED. So, my mind starts wandering, and I begin creating lists of all of the things that I need to do before the babies arrive. Hmm... not sure how that is going to happen from bedrest though. 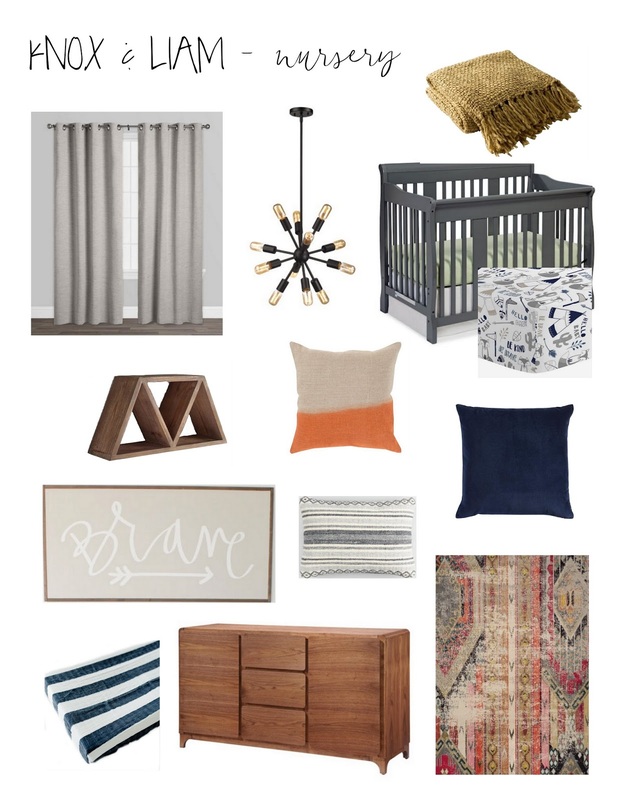 SO, to keep myself from going postal, I decided to pair everything together for the nursery, just to make sure it all flows. I've had a vision of what I want the room to look like for a really long time, but not having a house built to put the stuff in makes it a little bit difficult. Everything is in boxes right now, so I worry that it won't coordinate how I had imagined. Insert today's extra time and BAM - Knox and Liam's nursery. And I have to admit... it's my vision. I love it, and can't wait to get everything setup! Just a few more items to snag and we'll be ready for our boys. Although, at this rate, I'm sure they will be snoozing in the nursery at my parents house for a few weeks, or maybe the NICU. They are eager to get out here and enjoy this world. And as much as I want to see their little faces and cuddle them, I would much rather them hang tight until at least 34/35 weeks. So when you're saying your prayers - please add us to your list. Pray for a safe and on time delivery for Knox and Liam. Thanks, friends! Until next time. I told Staci, when I asked about your nursery, when we were at Kristi's house... I said I know it won't be like a "theme" like they do at Toys R Us, but I see here going with a vibe. I told her I could see you doing like navy, white, grey and maybe a hint of burnt orange or mustard yellow, or doing black and white with or without a pop of color... I think I came close to what your vision is lol. Oh my goodness, so sorry you are also in the hospital! Although I've been able to catch up on a ton of things, I've also been bored... crazy how that happens. ha! I think its the fact that I'm stuck and I can't go anywhere that makes me the most crazy. Everyone keeps telling me to enjoy the peacefulness before the crazy starts. I'm trying! Wishing you a quick and safe delivery, and an easy rest of your stay! Congratulations on your soon to be baby girl.